Epson, a global leader in printing technologies and market leader for ink tank printers, has launched its new line up of EcoTank printers that offer one of the lowest total cost of ownership in the market. Known previously as the L and M-series Ink Tank System printers, the newly branded EcoTank printers come with a new streamlined design with an integrated ink tank, in a more compact size and with innovative spill-free ink bottles. With this new innovative line-up, Epson has brought the integrated ink tank design to its entry-level ink tank printers for Small and Medium Enterprises (SMEs) and home offices. Epson has also expanded the line-up of its M-series printers, now known as Ecotank Monochrome series printers, with the new flagship EcoTank M2140 printer. The M2140 printer now incorporates the PrecisionCore printhead, bringing improved nozzle technology with increased print resolutions at 1200 x 2400 dpi, and faster speeds of 20ipm. The multi-function EcoTank Monochrome series comes with auto-duplex printing as well as scan and copy functions. The EcoTank Monochrome series are able to rival laser printers in terms of overall total cost of ownership and energy consumption, with the printers having 24 times lower power consumption, and bringing 27 times lower overall cost per print compared to laser printers in the Philippines. In terms of offering low total cost of ownership, the EcoTank L-series printers with a set of 4 ink bottles yield 4,500 black and white pages and 7,500 color pages, and the EcoTank Monochrome series yields 6,000 black and white pages. The ink tank printer is rated the most reliable ink tank printer compared to other brands. In a recent study, a large majority of Epson’s multi-brand dealers at 87%, ranked Epson as the most reliable ink tank printer compared to other brands. 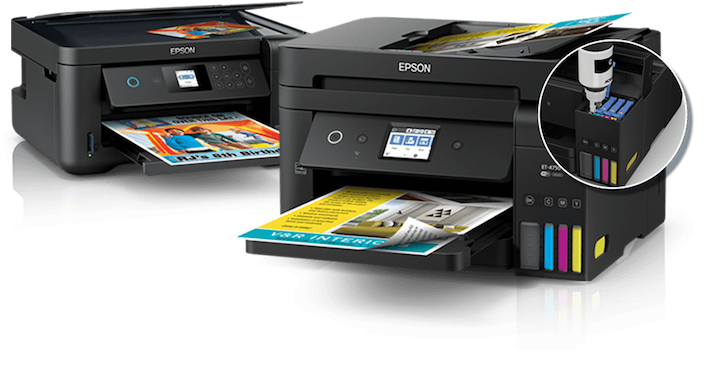 In terms of overall performance, according to the research, the majority of dealers at 77% are satisfied with Epson ink tank printers and 63% have a preference for Epson ink tank printers in comparison to other printer brands. “With the launch of our EcoTank Monochrome series, we aim to expand the market for inkjet printers and shift users from the entry-level laser printer segment to purchase inkjet printers. With the immense advantages it brings in terms of lower overall total cost of ownership and savings in energy consumption and improved impact to the environment, the EcoTank printers can offer a better alternative to laser printers for SMEs and home office segment,” said Eduardo Bonoan, Marketing Director for Epson Philippines. Epson continues to be the leading ink tank printer brand in the region with 70.1% market share as of 2017 in Southeast Asia, according to the latest IDC Quarterly Hardcopy Peripherals Tracker 2018 Q2 release. In the Philippines, Epson continues to be the leading ink tank printing brand, with the ink tank market share at 76% in 2017. There was an increase of 22.2% in terms of units sold in 2017 compared to 2016. Epson launched the first ink tank printer model in Indonesia and subsequently in Southeast Asia in 2010. The ink tank printer has sold a cumulative 30 million units worldwide as of July 2018. The EcoTank L3110 printer is the replacement model for L360 and L380 printers, and the L3150 printer is the replacement model for L405. The M1100 and M1120 models are replacement models for M100. Epson is a global technology leader dedicated to connecting people, things and information with its original efficient, compact and precision technologies. With a lineup that ranges from inkjet printers and digital printing systems to 3LCD projectors, watches and industrial robots, the company is focused on driving innovations and exceeding customer expectations in inkjet, visual communications, wearables, and robotics. Led by the Japan-based Seiko Epson Corporation, the Epson Group comprises more than 76,000 employees in 87 companies around the world and is proud of its contributions to the communities in which it operates and its ongoing efforts to reduce environmental impacts.